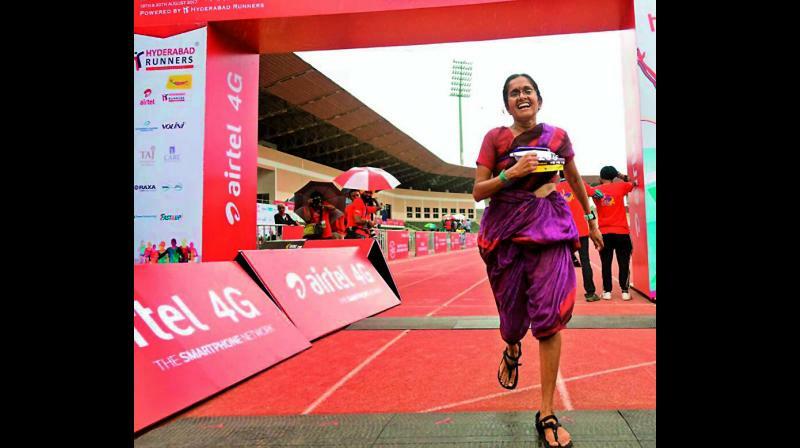 Jayanthi Sampath Kumar zooms her way into people’s hearts after running a marathon in a sari. All eyes were on Jayanthi Sampath Kumar at the humongous marathon on Sunday. As over 20,000 runners were sweating it out to reach the finish line, there was one lady who piqued everyone’s curiosity. As opposed to the usual tracksuits donned by many, Jayanthi’s sari clad look —almost warrior-like — complete with a bindi and sandals, turned heads. “It was a great experience! And yes, many were curious. They wanted to take selfies with me,” gushes Jayanthi, who ran a full marathon covering a distance of 42 km. While it is interesting that she ran in a sari, the reason behind it is all the more fascinating. “I want to promote handloom and encourage women. This is a statement of my support. I am a cyclist and ride very often, and notice a lot of plastic pollution happening around us. I am keen to curb that and want to use this platform to oppose it. For that, maybe I should run in a sari made of plastic wrappers people throw,” she jokes. Through all this, the 44-year-old might just have made it to the Guinness Book of World Records. Jayanthi has applied to win the title to have run the ‘fastest marathon in a sari’. “I informed them about my attempt. I am waiting to submit the evidence, which will come in the form of the certificate that the event organisers will provide. Alongside this, I had a cycle marshal helping me take video and photographic evidence. My coach, Dr Vignan, was also there throughout lending great support. The condition is that I finish the marathon under five hours. I think I have managed to complete it in that time,” she concludes. 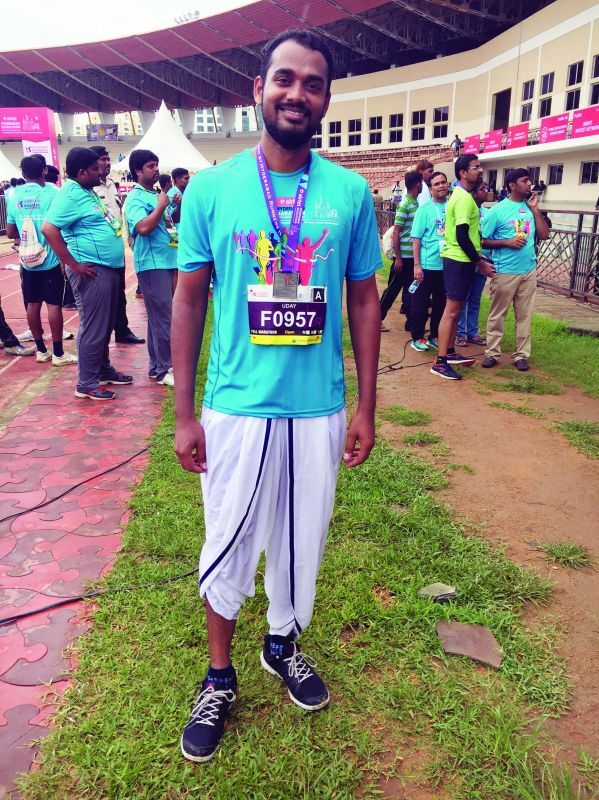 Uday Bhaskar Dandamudi, a 27-year-old from the city, who donned a dhoti for his full marathon, accompanied Jayanthi in her handloom journey. “I really wanted to be a part of it in some way!” shares the youngster, who has known Jayanthi because of their mutual interest in cycling. “Running with a dhoti was comfortable, except when there was wind! It blows like a balloon,” jokes Uday, who finished his run in a little over five hours and 15 minutes. Tags: jayanthi sampath kumar, guinness book of world records.